Deep in the mountains of Japan, legends of a mysterious and beautiful female Tengu have been passed down from ages old. She is said to have descended into the human world out of simple boredom, but since rumors of Bankotsubo's death reached her ears, taking revenge on the ninja who killed him has become her single obsession. 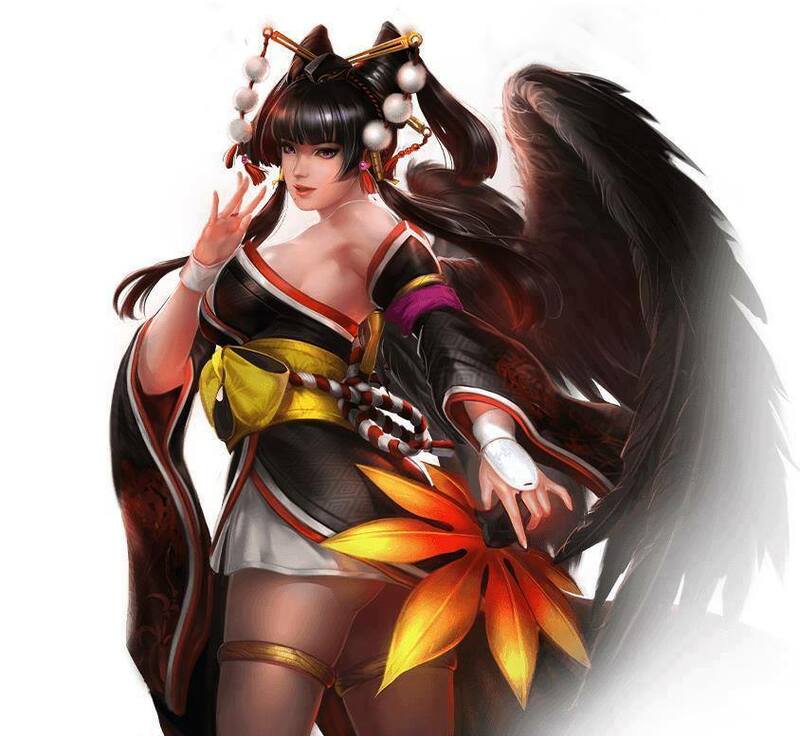 Nyotengu is approximately 1018 years old. Her haunting beauty belies an incredible strength, which along with her ability to fly and attack from midair, makes her a formidable opponent. She practices Tengu-do, a unique Japanese martial art passed down since ancient times. 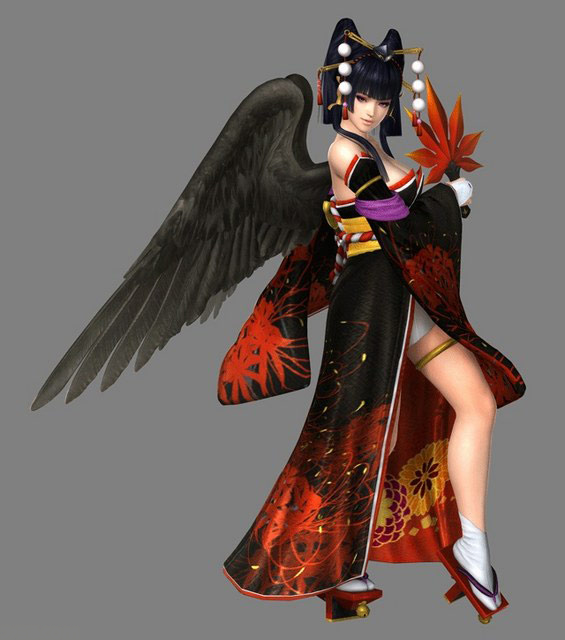 Tengu (Bankotsubo) was a weird yet somehow memorable boss in DOA2. His absence in the later games seemed like the right choice... as he wasn't a superb design or anything. In typical DOA fashion, the designers sought out to add yet another female for the roster... but this time, it actually seems to make sense. 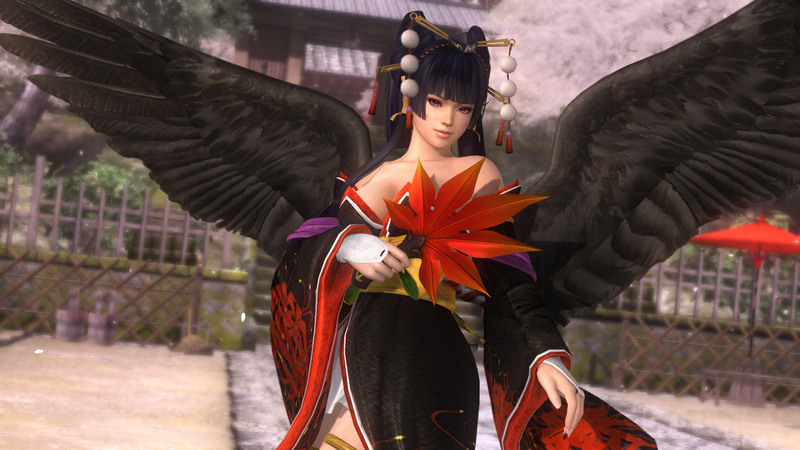 Nyotengu cleverly pays homage to the DOA2 boss in several ways, and she actually offers some uniqueness to the roster. Along with having quite a few of Bankotsubo's moves, Nyotengu's moveset contains some full-screen attacks (including a full-screen wind 'projectile' of sorts), something that very few DOA characters have. Her semi-flight abilities & hellsweeps are pretty cool too, and definitely reminiscent of TEKKEN's Mishima characters. Overall, her moveset is different enough from other DOA fighters to stand out. It's also always cool seeing a character with "super-human strength" join the roster to mix things up. Visually, she's a pretty design... but lacks excitement in other areas. And she's definitely not an "honest" character in terms of the way she fights. Meh.